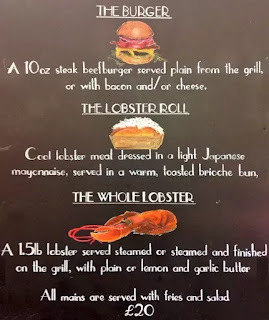 Last week I had a client lunch meeting in London at Burger & Lobster in Harvey Nichols on the 5th floor. I am sure the foodie area is on the top floor so you end up browsing each floor as you come down the escalators. I first visited the Soho branch back in 2012 pretty much a year after they opened their first restaurant and I have been wanting to go back. There are so many great places to eat in London and we don't go often as we use to I find it so hard to go back to some of the great places we have eaten in previously. Since I was with a client it was a great opportunity to go back once again! For those who have never heard of this place it's pretty simple there is no menu just a black board and you just pick which you want burger or lobster! I am sure prices have increased slightly since and we paid around £25 for the lobster roll and £26 for the whole lobster which is still very good value. Everything is served with fries, salad and a small pot of lemon garlic butter sauce. I opted for the brioche bun this time since it's easier to eat while chatting and my colleague went for the full lobster! You have the option of steamed or grilled for the whole lobster so I suggested grilled. Absolutely delicious as always especially the lemon garlic butter sauce and I could have done with a bit more really but other than that very tasty! They have restaurants dotted around the world click here to find one near you.